Something that has often bothered me about climate models and rain water is how the energy transfer to the rock is handled. Each climate model I’ve read seems to address the problem in similar ways with bulk conductivity parameters that appear to ignore anything but conductive energy transfer to significant depths with basic flows of energy at shallow depths. The result is that there doesn’t appear to be much effective thermal mass in our land area on Earth. The consequence of this is that land thermal mass holds nothing of great effect with respect to global warming. Climate models are absolutely missing something important here. I’m not sure what reference would best illustrate the point, Trenberth has a powerpoint presentation up at this link which summarizes the complex parameterization of climate model land usage. The reference is pithy but explains quite clearly how modern science interprets ground thermal mass. The heat capacity is treated as small which on the surface (some pun intended) seems reasonable. However, conduction is almost always a minimal factor in a situation where fluids are present and physical mass flow exists. In the surface of the ground on earth, we have significant physical thermal mass flow —>downward. Always downward.. well nearly always anyway. Did you know that a century of today’s worst case global warming heat can be stored in the deep oceans with only an approximate 0.1C rise in temperature and that 0.1c is leaves the oceanic mass very near freezing in temperature? Did you know that the huge oceanic thermal mass is only 10% of the water in Earth’s crust? In effect, the only thing which conceptually allows our temperature to measurably rise with today’s minimal CO2 forcing is the lag in thermal transfer to these huge thermal masses. Oceans are said to mix on over-century timescales. Water and ocean, conduction and convection effects are stated by modern science to be too slow and therefore dangerous warming can occur. Interestingly, land thermal mass seems to have a very high transfer rate and is quite nearly ignored. I don’t believe this very significant aspect of global warming has been vetted thoroughly and you shouldn’t either. While we do have a huge amount of water on Earth and contrary to public schooling, will not run out due to human usage, we have a lot more rock in the Earths crust than we have water. Moreover, heat penetration into land is limited by the low thermal conductivity of the land surface; as a result only the top two meters or so of the land typically play an active role in heat storage and release (e.g., as the depth for most of the variations over annual time scales). Accordingly, land plays a much smaller role than the ocean in the storage of heat and in providing a memory for the climate system. This type of paragraph is surprisingly common argument, presented as a mere handwave rationale to define the necessary land depths used in climate models. While annual temperature invariance of deeper soils sounds like a reasonable rationale to cut off the depths of modeling layers, it fails to take into account the relatively lower thermal mass of water passing through the soil on an annualized basis, and the continuing nature of the increased energy input to that same soil caused by warmer atmosphere. Another example of a climate paper which discusses only conductivity of soil without discussion of net flow. It seems really obvious to me that the heat from rain, and the slow but regular downward convection of fluid through the massive amount of rock will lead to little seasonal temperature change of the soil but a very large heat storage device. The capacity for this storage can easily eliminate the higher frequency seasonal variations and yet ignore the conductive heat transfer of decadal term climate signals. The result would be vastly underestimated thermal absorption by the thin surface layer conduction models used in modern climate science. As an example, California’s rain has to pass through hundreds of feet of rock before it reaches ground water. Does anyone expect a few inches of rain to affect the seasonal temperatures of rock? I don’t, but over time the heat from 0.6C warmer than average rain will certainly be stored there. The heat will have a great deal of difficulty conducting upward due to low rock conductance and a continuing downflow of new rain water percolating through the rock material. Yet conduction is what climate science recognizes and a few meters of surface material seems to be the critical part of land thermal mass modeling. This is wholly inconsistent with the much better known science of hydrogeology. Here is an article showing the age of water in a typical well. The oldest being ~ 300 ft deep and 30 years old. So gradual down-flowing rain has been pushing extra heat from globally warming temperatures into this rock for at most 30 years. A hundred meters of rock over 30 years as a typical measure of land mass thermal absorption. The water went through the rock, the heat definitely reached equilibrium with the rock over that time and the water holding the global warming heat is still contained within the rock! Of note, while the wells in the paper seem to stop at 100meters, the water certainly didn’t. Do you think climate models take into account this massive heat storage capacity? So we know from my link above that water can regularly get into a 100 meter well in 30 years or less, yet this climate model only calculates the first 1.4 meters, and apparently only for thermal conductivity. I’m just not seeing the convection parametrization you would expect for downward water flow, not that I couldn’t have missed something in this model while reading another, but it does not appear to be there. Our latest version, CRCM4.2 is even more in-line than CRCM 3.7 with the CCCma GCM3 package (Scinocca and McFarlane, 2004). The most important change consisted in the implementation of GCM3’s multi-layer surface scheme CLASS 2.7 (Canadian LAnd Surface Scheme; Verseghy, 1991; Verseghy et al., 1993) in the CRCM to provide a more realistic description of water and energy exchange between the land surface and atmosphere. Starting from the surface, CLASS uses three soil layers with thicknesses of 0.1 m, 0.25m and 3.75 m, corresponding approximately to the depth influenced by the diurnal cycle, the rooting zone and the annual variations of temperature, respectively. CLASS includes prognostic equations for energy and water conservation for the three soil layers and a thermally and hydrologically distinct snowpack where applicable (treated as a fourth variable-depth soil layer). I know that in our house, we have a cracked basement wall, and after a very hard rainstorm our wonderful finished basement can get water in that particular corner. The wall is 2.5 meters underground at the base and it takes literally hours for the water to reach that depth. We have had some specialists out twice for the problem and they will be coming back again. However, 1 day isn’t an unreasonable expectation on any percolating soil to over 2 meters depth. The increased heat added to the ground of a single rain at that depth is going to take months to measurably influence the rock, and if another rain hits, it will be dragged further downward instead of conducting up to the surface. The heat capacity of water is 4 Kj/kg-K and the heat capacity of sand is 0.19 or about 21 times less than water. However the density of sand is 1600 Kg/m^3 and water is 1000Kg/m^3. If you get 0.1 meters of rain in a month, as we approximately do, an equal heat capacity layer of sand has a depth of 1.3 meters. If the water is 1 C warmer, and was contained to 1.3 meters, then the land should warm by 0.5C at that depth and the water should cool by 0.5C. In practice, the continuing downflow will carry that warmth to an even greater depth. New rainfall continues the process, carrying the new heat ever deeper. Of course we would expect very little monthly temperature variance at 3 meters depth because the thermal mass of the rock has dampened the variations in rain water temperature. I hope I have explained well enough to show that while this thermal capacitance dampens high frequency signals, it does nothing to preclude energy from hundred year warming caused by CO2 from penetrating to great depths. To me this is a very big problem with climate modeling. It is not a minor issue to be brushed off as current modeling does, and this missing heat should be considered carefully. Perhaps I’m missing something special here, it wouldn’t be the first time, but at this point I can’t imagine what that might be. Update per request from Mark Cooper. A typical soil temperature range vs depth in winter and summer seasons. The graph shows net power flow is upward in the winter and downward in summer. For some reason the graph won’t upload to wordpress, so the link is the best I can do.I tried to make the point that the net direction of heat flow is not the important factor with respect to global warming but rather the change in magnitude of heat flow due to warmer temperatures is the critical factor. That may not be clear in the post above. Data is dangerous as many a paleoclimatology paper can demonstrate. Big data is statistically more dangerous, and the satellite sea ice data record is a multi-gigabyte set. Some years ago, your not-so-terribly-humble correspondent made a small error which was published here, and at WUWT. I downloaded the global satellite data for sea ice and did not correctly apply the missing “hole” in the data for the entire time series. The result was an inaccurate trend and associated conclusions. It was of course, embarrassing, and I did apologize quickly and fixed the data set. Any scientist would. The reason for the problem was that the documentation at the NSIDC wasn’t really up to snuff and I was new to the data. They very efficiently and quickly corrected the metadata record. Grant Foster, who posts as Tamino on the inappropriately named “open mind” blog, took a couple hours of his day to write a teasing post on the error. In March 2015, while editing the data processing code to apply the SSMIS pole hole mask, it was found that the Sea Ice Index processing code had been applying the SMMR pole hole mask over the entire Sea Ice Index time series when computing the daily extent numbers instead of using the SSM/I pole hole mask beginning in July 1987 as the monthly data processing does. Because it is assumed that the entire region under the pole hole mask is ice-covered and because the SMMR pole hole mask is relatively large, some sections of open water, regions with less than 15 percent ice concentration, were being unknowingly included as sea ice in the daily Arctic-wide ice extent number. At the time of this mask correction, 132 incursions of open water into the SMMR pole hole mask had taken place in recent years. The first occurred in 1987. However, until 2007, all of these incursions had areas of less than .01 million km2 which is below the precision of these data. Between 1987 and 2013, the size of the open water in the SMMR pole hole mask ranged in area from 1800 km2 to 10,000 km2. Figure 19 shows the worst-case scenario, 22 September 2009, where approximately 10,000 km2 crept into the SMMR pole hole area (red area in Figure 19). 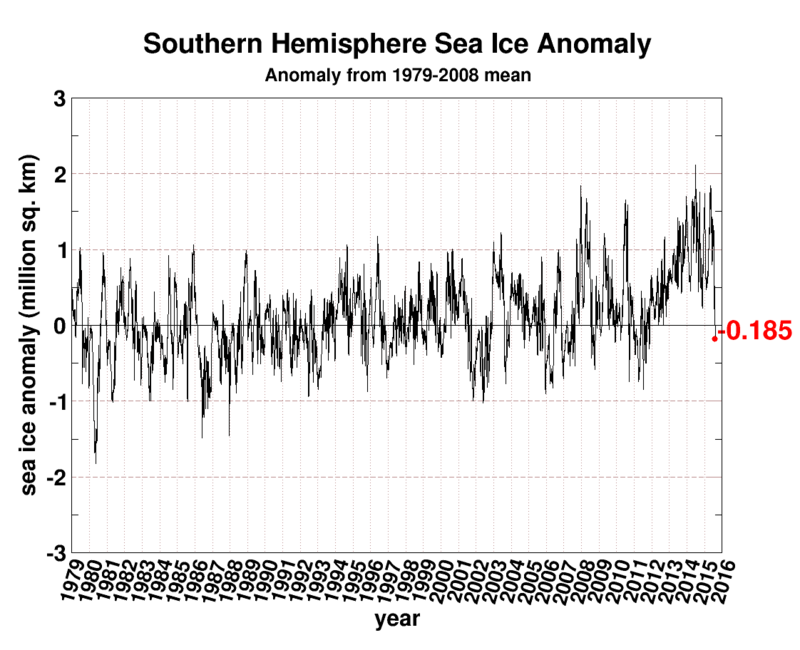 The version 1.2 release of the Sea Ice Index corrects this processing oversight. All concentration data up to the latitude of the appropriate pole hole are used in the calculation of Arctic-wide extent. As a result of this change, there are slight decreases in the corrected daily extent number for some days in the record. These small changes do not affect the monthly anomalies and trends, however, which are reported to two significant figures. Again, they professionally and scientifically announced and corrected the record. Kudos again NSIDC. The Antarctic ice is melting and is well below average for the first time in 3 years. Global sea ice is also below minimum. It looks like the death spiral has come to pass…. Except that it is winter there and that means it is simply not freezing at a typical rate. It still spells doom though, I’m just not sure how. Dual Title Day: Line up for your Brownouts. or Future America to Produce Energy by Harnessing Happiness. By clamping down on power plant emissions, Obama is also working to increase his leverage and credibility with other nations whose commitments he’s seeking for a global climate treaty to be finalized later this year in Paris. As its contribution to that treaty, the U.S. has pledged to cut overall emissions 26 percent to 28 percent by 2025, compared to 2005. The people who support this policy are comprised of complete idiots, power hungry politicians and anti-industry left-wing radicals who pretend to have knowledge. Some of you read here so if you support this idiocy, you can find your own grouping. Of course all of the pro-government nonsense is funded by theft of our money through unsustainably high government taxes. The actual price is unknown until states decide how they’ll reach their targets, but the administration has projected the rule would raise electricity prices about 4.9 percent by 2020 and prompt coal-fired power plants to close. Does 4.9% even begin to pass the smell test for costs created by stopping power generation from combustion – without the introduction of safe clean nuclear power? NO it doesn’t, for those who can’t figure it out. You need to be an idiot to believe that it might but plenty will ‘feel’ exactly that. Rocks and feelings do not make good decision engines. I’m not alone in this, America just does not have enough thinkers anymore to see clearly and overwhelm the political nonsense.